Sometimes, when trying to fix one situation, you create a whole new situation. Our current situation is having 3 coordinating light fixtures, which to some isn't a situation at all, but I never intended things to be this matchy matchy. That's what happens when you change light fixtures one at a time without a clear vision. I have 2 fixtures left to pick out on the main floor (kitchen pendants and a foyer chandelier) and I MUST change things up a bit. Here's a few that have caught my eye for the kitchen. 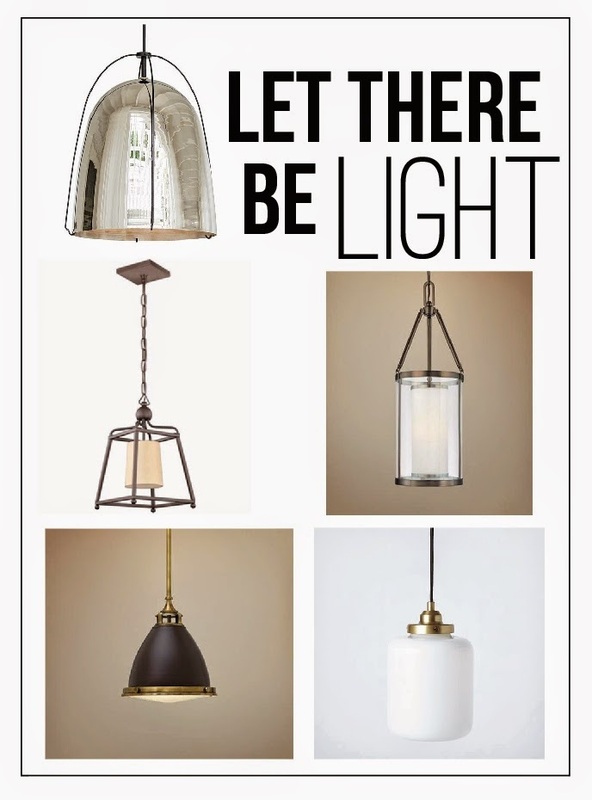 I'm a bit torn because I like the look of clear glass pendants, but I'm afraid seeing the lightbulb will be glaring and harsh, so I'm trying to find alternatives. Decisions, decisions! I'm not kidding around about Trouble being my favorite game. What's your favorite game? Love all of these options and especially the bottom left! That would be my choice...the clear glass pendants would be hard to keep clean in my opinion.